2014 Liquid Force Classic Wakeboard - Brand New. They just get more appreciated over time. The CLASSIC wakeboard is back for 2014 and continues to prove that some wakeboard designs are timeless. Built and designed for optimal fun on the water, this board is quick rail to rail and continues to be a boat favorite for some of our best riders, including Raph Derome. Equipped with an Aggressive 3-Stage Rocker that provides solid pop off the wake, a Lifted Variable Edge Rail that gives you optimal response and control where you need it, and Quad Vented Channels in the tips that generate speed and hold at the same time. Extremely user friendly, the CLASSIC has a performance feel that still offers a bit of forgiveness on the wake. Continue to excel and improve your riding with the CLASSIC! Boosts you into a high arcing pop for the wake to wake rider that wants to launch. Spiral V with Double Concave Mid-Section. Breaks the water for soft landings Vee initiates and rolls into turns quicker and smoother. QVC - Quad Vented Channels at Tips. Placed between fins to vent water through the tip - Gives lift without disrupting water flow. Rounded center rail for a forgiving feel, sharp tail rail for edge control and response. More defined, shorter base fins provide positive control without catching too early in turns. 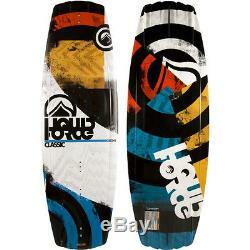 The item "2014 Liquid Force Classic Wakeboard Brand New Free Shipping" is in sale since Thursday, September 25, 2014. This item is in the category "Sporting Goods\Water Sports\Wakeboarding & Waterskiing\Wakeboards". The seller is "sanbarmarina132" and is located in Lake Hopatcong, New Jersey. This item can be shipped to United States, to Canada, to United Kingdom, DK, RO, SK, BG, CZ, FI, HU, LV, LT, MT, EE, to Australia, GR, PT, CY, SI, to Japan, to China, SE, KR, ID, to Taiwan, ZA, TH, to Belgium, to France, to Hong Kong, to Ireland, to Netherlands, PL, to Spain, to Italy, to Germany, to Austria, RU, IL, to Mexico, to New Zealand, PH, SG, to Switzerland, NO, SA, UA, AE, QA, KW, BH, HR, MY, TR, BR, CL, CO, CR, PA, TT, GT, HN, JM.